What to Say to your Son before Sending him off to College! Leaving for college is a significant milestone. It is a stepping stone to adult life even if the college student will still need a family for financial, moral and emotional support. It is a bittersweet passage for everyone involved. While the young adult headed for college may happily anticipate the freedom of being on their own among peers on a college campus, deep inside they also fear to be away from the safe and unconditionally supportive environment of their own home. On the other hand, parents and others who have played a significant role in the student’s also undergo separation crisis, worried and anxious about letting go. Here’s how you can express those sentiments. Down below, you will find the best “off to college” wishes you can send to your child that are guaranteed to get the message across! After all those years of watching you grow into a beautiful young man, you finally set your path and leave us to live your own life! We are amazed at the brilliant and beautiful man you have become! So proud and yet so anxious to see you head off to college. Shine on! No matter what happens, we want you to know that we will always be your proud parents. There will still be a home waiting for you no matter how successful, famous and powerful man you become. All those years are picking up this lovely boy from soccer practice never made me realize that after you leave, next time I’ll come to pick you up is when you finally are a full-grown member of society! Listen and learn. Ask questions then question the answers. Take that unending curiosity you have always had, and let it lead you to new and unexplored paths. Enjoy the journey, son. Our hearts are heavy at letting you go, but we know that this is part of your destiny. You have a bright future ahead, and we will be proud of everything you accomplish. From a boy that could never clean his room to a young man that now has to manage an entire dorm room by himself! You have surely grown my love. If you’re strong enough to call yourself a man, then the college should be an easy thing to get by! A real man always chases after his dreams. So, whatever it is you want to become, you must do whatever it takes to reach it. Thus, the degree you will get will become an invaluable tool in your path to accomplishing your dreams! Looking at my baby-girl growing up to become such a remarkable young lady never ceases to amaze me. You have to know that I’m proud of you and I hope you achieve everything you want to in life. This parting is such sweet sorrow. We know you will do well where you’re headed. You have demonstrated your brand of courage and brilliance as a daughter, sister, and friend to so many who love you and look up to you. Keep up the good work! It has been a long journey and enjoyable from the time we brought you home from the hospital to today’s parting. You are a gift to us and to everyone whose lives you’ve touched. Having your feminine grace around the house made the atmosphere lovely. Now that you’re gone, the house won’t be the same! Now that you’re gone, your room is going to become a man cave so I can watch all the football games I missed while raising you! Have fun in college. I know you’re a responsible person, but if I have a favor to ask, please don’t drink as much as I did in college! You always were the best daughter we could have wished for. We want you to know that you made us extremely proud by going to college and that we are going to miss you more than you can imagine. So make sure you have fun and become the person you always wanted to be! There always comes a moment when parents realize how much their child has grown. This usually comes in the form of an accomplishment, such as their baby finally leaving home to go to college. One can only imagine how proud you must be feeling right now and this probably is a moment of mixed emotions! Besides the expected happiness that overflows everyone in the family, lingers a little dose of sadness, knowing that the child you’ve put so much love and effort into raising is now not going to be part of your everyday life anymore. All these emotions are usually hard to put into words, but worry not because this is why we are here for! As you head off into the next phase of your life, we ask that you remember all the lessons of kindness, compassion, and unselfishness that you have learned thus far. Take these lessons to heart, and spread them to others. You were always delightful as a child – curious, compassionate and so willing to learn. We trust that you will take on the world with the same drive and passion. Never lose sight of who you are no matter how far you may go. We will always be here for you. Congratulations on entering this new stage in your life. The road to success is never straight and narrow. We hope that we have prepared you for every possibility, but likely not. Nonetheless, you are brave of heart and pure in spirit, and you will succeed if you put your mind to it. We know that you’re excited to move on. A college is an exciting place where you will have a minimum of adult supervision, so please remember that you are now responsible for all the consequences of the decisions you make. Listen with wisdom and compassion as you always have as a child, and you are bound to make the right choices. We raised you to have a good heart; now share that goodness with the world. 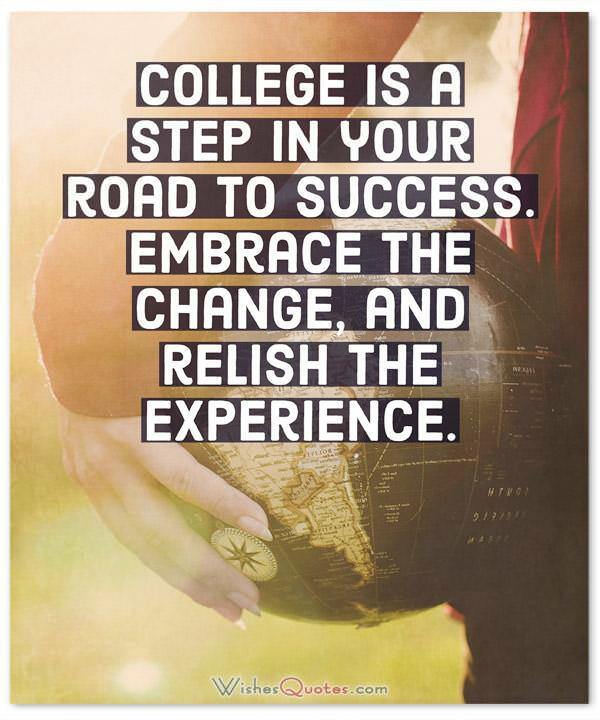 College is a step in your road to success. Embrace the change, and relish the experience. In our hearts, you will always be the little boy/girl who never stopped asking why. Continue to do this through college, and you may find the answers to life’s most pressing questions. No matter the time, remember that mom and dad will always be available to answer questions, to listen to your frustrations and to celebrate your successes. Call home once in a while. I know that leaving home can be as exciting as it can be scary. So, I want you to promise me that you will try your absolute best to make the most out of this experience and let these years be some of the most memorable of your life. This is an opportunity for you to spread your wings and embark on a magical journey! You will meet new friends and become surrounded by people that like the same things you do! 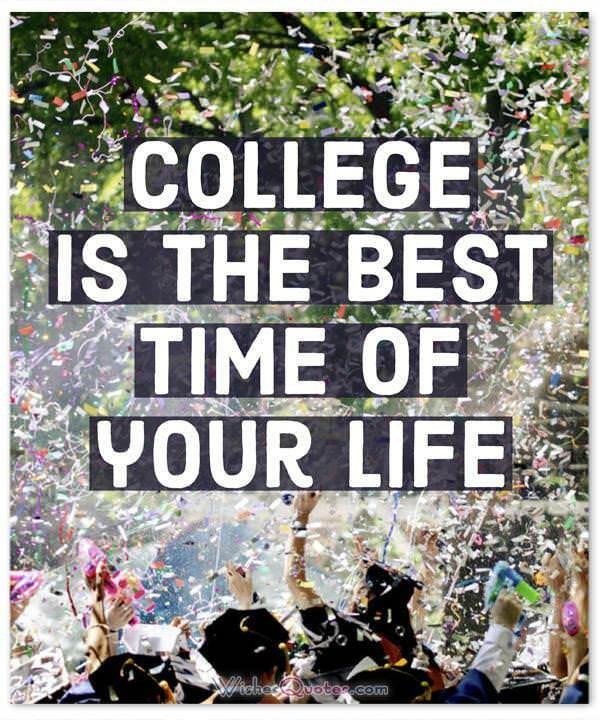 So, make the best of it and enjoy college! No matter how much we call you, or Skype with you, it won’t be the same as having you close to us and amazing us with your charming personality like you always do! So make sure you come by to visit us once in a while! Our house is going to feel empty once you’re gone. 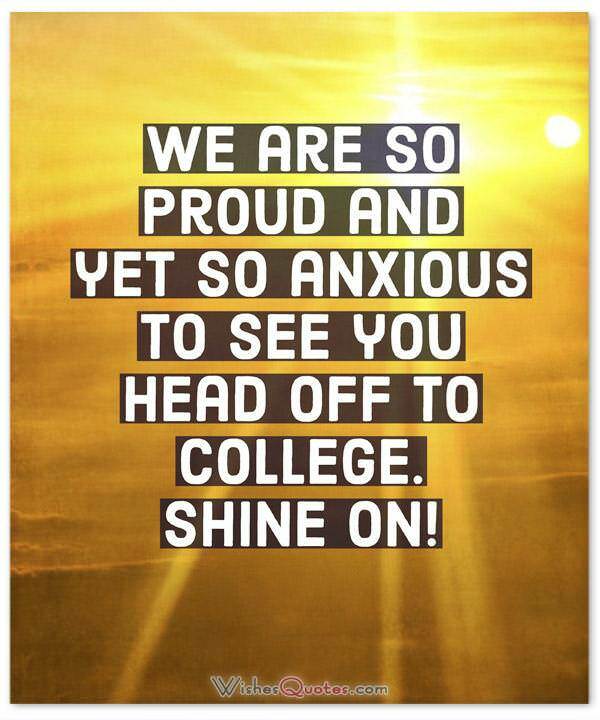 So make sure you make us proud with your college accomplishments so that our joy fills the void of your absence! Now that you’re gone, movie nights are going to feel so empty without you always selecting the best film for us to watch! At least now we can watch all the videos you send us from your brand new college life! Ever since you were a baby, I always told you that you could be whatever you wanted to when you grow up! You’re now proving me right, by going to college to pursue your dreams. I’m so happy for you! High school was tough, but what lies ahead is even harder. Whatever happens, though you must stay focused and do everything in your power to achieve your dream! Have fun in college. The first day in college is always a weird one. All those young kids that just left home bundled up together trying to chase their dreams. I know you’re feeling both excited and afraid, but that’s how everyone feels! So try to make new friends, have fun and enjoy your college years as much as possible without leaving your academic obligations behind! These are the years that you will remember the most after you’re a grown-up like mommy and daddy. They are the years of absolute freedom when you get to decide your future. So promise me that you’ll make the best of it! On this new journey, you are about to embark on, you will meet new friends and shape your new life the way you want it! So, if there is one thing I can wish, is for you to have fun! Enjoy college. College is the best time of your life. By David Wood. College is the reward for surviving high school. By Judd Apatow. Today is your day! Your mountain is waiting. So…get on your way! By Dr.Suess. A university is a college with a stadium seating over 40,000. By Leonard L. Levinson. Always hold your head up, but be careful to keep your nose at a friendly level. By Max L. Forman. There is always a moment in childhood when the door opens and lets the future in. By Graham Green. Children have to be educated, but they have also to be left to educate themselves. By Ernest Dimnet. Human beings are the only creatures on earth that allow their children to come back home. By Bill Cosby. These are my daughters, I suppose. But where in the world did the children vanish? By Phyllis McGinley. Whoever said it first spoke with insight and wisdom: you don’t own children, you only borrow them. By Anne Linn. The most important thing that parents can teach their children is how to get along without them. By Frank A. Clark. An investment in knowledge always pays the best interest. By Benjamin Franklin. Life affords no greater responsibility, no greater privilege, than the raising of the next generation. By C. Everett Koop. The greatest gifts you can give your children are the roots of responsibility and the wings of independence. By Denis Waitley. Parents lend children experience and a vicarious memory; children endow their parents with a vicarious By George Santayana. Making the decision to have a child is momentous. It is to decide forever to have your heart go walking around outside your body. By Elizabeth Stone. But a wise parent humors the desire for independent action, to become the friend and adviser when his absolute rule shall cease. By Elizabeth Gaskell. A man who has never gone to school may steal from a freight car; but if he has a university education, he may steal the whole railroad. By Theodore Roosevelt. A child enters your home and for the next twenty years makes so much noise you can hardly stand it. The child departs, leaving the house so silent you think you are going mad. By John Andrew Holmes. When I was a boy of fourteen, my father was so ignorant I could hardly stand to have the old man around. But when I got to twenty-one, I was astonished at how much he had learned in seven years. By Mark Twain. The school will teach children how to read, but the environment of the home must show them what to read. The school can teach them how to think, but the home must teach them what to believe. By Charles A. Wells. If you would have your son to walk honorably through the world, you must not attempt to clear the stones from his path but teach him to walk firmly over them – not insist upon leading him by the hand, but let him learn to go alone. By Anne Bronte. That was it! I hope you enjoyed and that you found a way to convert your thoughts into words so you can get the message across to that youngster now finally leaving home! This is a big step for the kid, so whatever you do try to be close to him/her and help out with the transition of emotions that are sure to come! I know this is painful for you as well, but this is the best way for your kid to become the person they always wanted to be!